Pablo Gómez is one of Mexico’s outstanding guitarists. 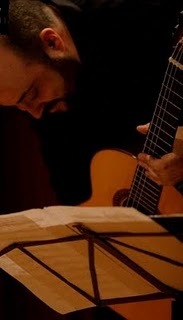 His repertoire, unfailingly original and unconventional, explores a variety of aesthetic tendencies, including contemporary and twentieth-century “classics.” Gómez began his musical studies in the Escuela Piloto de Iniciación a la Música y a la Danza. He graduated with honors from the National Music School of the Universidad Nacional Autónoma de México. Pablo Gómez has participated in various new music festivals, notably the Ferien Kürse für Neue Musik (1994, 1996, and 2002) in Darmstadt, Germany, the IV Festival Franco Donatoni, the Foro de Música Nueva Manuel Enríquez and the V Search Event in San Diego, California. He has performed in the US, Sweden, and Germany, as well as in many Mexican cities. Pablo Gómez first compact disc is “Tañendo Recio.” Between 1997 and 2001 he taught at the Conservatorio de las Rosas in Morelia, Michoacán. 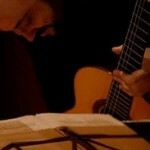 In 2003 he was appointed with a teaching position at the Escuela Nacional de Música from the National University in Mexico City. Today he pursues a postgraduate study program at UCSD.